← Photo Wallpaper – from your digital photo! Ever since they came on the market, we’ve thought that there’s nothing better than a retractable banner stand to travel around with a visiting expert. Here’s one we just did for a celebrity chef doing a tour of college cafeterias. In about ten seconds she can have signage that tells everybody what is going on and who is doing it. The other great thing about the banner stand is that you can put it wherever it needs to go, move it around as needed, and never have to worry about how you are going to fixture it. It’s completely self contained. When the event is over, you let it retract into it’s canister, and put the whole thing into a handy nylon carrying case. Put it over your shoulder and off you go to the next place. We like the idea for a visiting chef, and it works great for author book signings and visiting speakers just as well. We also see them used extensively at trade shows, in retail, and in public areas like airports and train stations. 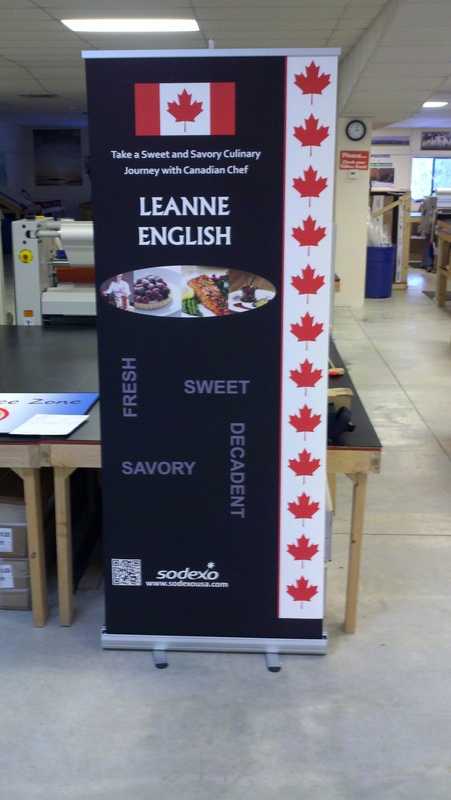 Whenever you have a need for portable signage, give a retractable banner stand some consideration! This entry was posted in Banner Stands and tagged author signing, moveable signs, portable sign, retractable banner stands. Bookmark the permalink. I’ve done table top display marketing for 30 years. One thing I was always frustrated with was how to hang banners or signs over my table instead of in front of it. I used to hang on the wall behind with tape but the tape usually let go halfway through the show. I did pvc pipes and wood and never got the right solution until I came across a product called the ezframe ( http://www.ezframecompany.com ). It worked great, was adjustable for different sizes and configurations. Would definitely recommend if you are looking for a low cost solution. Thanks.